Re: TomWilliams2000 enquiry regarding his mystery "purple" Coughtrie light. I know just what you are referring to. The purple tinge of the bowl is very distinctive. We had them at both infant and primary schools back in the 70s - very tough fittings! They are indeed by Coughtrie and are referred to as a SBB-15. Interestingly, a chap on Ebay is selling some NOS fittings for about £25! Quite a retro item now apparently. Below is a scan from my "TN Robinson Ltd" electrical catalogue, circa early 70s. The Coughtrie range of the period is comprehensively stocked as you would expect. Anyway, the SBB-15 is listed as being a surface mount fitting, with knockouts for conduit entry on the top, bottom and rear. There was also the BB-15 which was for back entry mounting only, via a BESA box. Both versions were designed to accommodate a 150W GLS lamp although interestingly, there is no mention of the polycarbonate bowl. These fittings were supplied with "Opaline" glassware only. Presumably, Coughtrie offered polycarb as an option in subsequent batches, before abandoning glass bowls entirely. Referring to a later "HP Hunter Ltd" catalogue, the same light is still offered, however the design of the polycarb bowl is more oblong in design (although it would probably still have that characteristic purple tinge). The polycarbonate bowl was pretty much indestructible, as evidenced below. This member of the class managed to stay awake, even when the local primary school was being dropped on top of it! I have a couple of BB.15's and a plastic bowled SBB.15 in the collection. Both of my glass bowled BB.15's and my plastic bowled SBB.15 have all got opal/white covers, but I have seen some very purple glass covered versions on an old (now demolished) school which was built in the mid 60's. I've also got a BH.10 Bulkhead, which is mentioned below the BB.15's in the catalogue page above. I have some photo's of them posted in this thread. In this era of LEDs with their 20 year plus life span, it seems incredible that these fittings when originally installed, would be routinely fitted with a 150W GLS lamp with a projected life of just 1000 hours. Granted there were also double life lamps around, but in today's more eco aware environment, 150W seems an awfully excessive load for a bulkhead. The chap with his ladder would have been kept busy in those days, especially on large installations. No doubt, bulk relamping was the rule back then - unlike today. 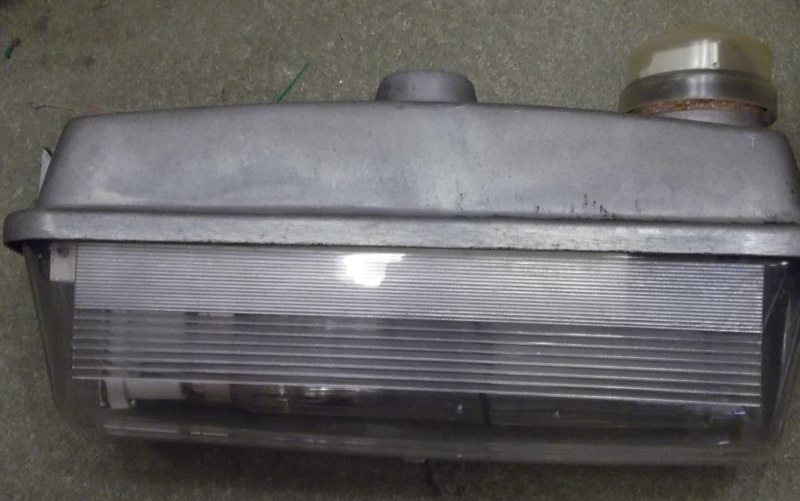 Interestingly, I have a large box of clear 150W GLS lamps, which were obviously bulk changed in the 1970s (the date when installed is written on the caps). They were made by Thorn, under their Omega brand. Omega lamps were typically specified by large volume users such as LAs and the NHS. Judging by the state of the filaments, the previous user does seem to have had their money's worth out of them, although none have been burned to extinction. You will notice these are 2500 hour lamps. Although double life lamps had been around for a good while, Omega managed to squeeze a little bit more out of their filaments, but at the expense of light output. Continuing the theme for unidentified lanterns, perhaps you can help with these two. The first I'm afraid is one of those "lost opportunities which never was", in so much that I only came across it whilst nosing around GSV. Sadly , it s too late to do anything constructive but there you go! The location is Richmond Road in the sprawling Trafford Park estate, although I think it is actually classed as Stretford. Although a fairly mundane building, it does (to me anyway) have something of interest. It has on its wall what I think is quite a vintage sodium lantern. It certainly isn't a pipe or bracket. Anyway, the lantern is seen here perched on the wall of a factory building. Although not too clear, I believe this was a Revo C12662 for a 140W SO/H. (See images below to compare). Can anyone confirm this? Whilst looking reasonably modern, the 1980s style cladding attached to the exterior, hides the fact that the place was probably built in the 1950s. Presumably still active at the time, it looks like the lantern has been left in situ / refitted, with the (new) cladding applied around it. Since the GSV was compiled, the entire complex has been demolished (Google maps show the latter stages of the work in progress). Suffice it to say, this rare survivor will no doubt have been lost at the same time. The second lantern was another one which I came across, whilst a peruse on the many urban exploration sites. One of their more recent explores was the former HMP Holloway. In one of the exterior areas is this column with an unusual post top lantern. I have seen one of these before (on some b/w film footage somewhere). The square canopy and general oblong construction is quite distinctive. It actually looks like two separate MCF lanterns fixed back to back, on one base casting. The bowls look to be individual too! Apparently, HMP Holloway was rebuilt in the 1970s, therefore it is reasonable to assume it dates from the same period. Any ideas on the manufacturer - Phosco, Philips? Over the past few months I've discovered some lanterns just outside of Lincoln city centre which I'm struggling to identify. the first is at a garage on Dixon Street, it runs SON and is very large. The next is a two minute walk from the one above, on Dixon Close, and appears to predate the swathes of Philips MI36s and MI50s which dominate the minor roads outside the city centre. I also have a photo of it lit. The last two are attached to a factory wall on Beevor Street - both out of use thanks to a column mounted LED situated nearby. I have no clue what they are but the newer-looking one could have used fluorescent bulbs? Three generations of street lighting here! Your 2nd and third links are of a Phosco P283. The lantern on the left of your 4th link is a Thorn Alpha 5, assuming its running SOX or SLI lamps. This was based on the earlier AEI Fleetwood, that ran fluorescent tubes. The lamp holder visible in the end of the bowl, suggests it may have run the now obsolete SLI lamp, which maybe why there is a newer lantern to the right. The last two are attached to a factory wall on Beevor Street - both out of use thanks to a column mounted LED situated nearby. I would concur that the lantern on the left is indeed an Alpha 5. Not many of these left nowadays. Your other pictures indicate it has been out of use for some time and has even had its SLI lamp removed. They both appear to be part of the extensive factory installation, rather than ex council. The neighbouring top entry lantern on its fancy bracket, looks to be a Metrovick SO Fifty. A popular lantern in its time, it was promoted as the first all "perspex" totally enclosed lantern for 85W and 140W Sodium lamps. In order to provide the required structural support for the canopy and lamp, the iron support yoke can clearly be seen. Interestingly, these are not the only relics which are still "in situ". If you pop further down the "works" towards the "EMR" scrapyard at the bottom of Beevor Street, there are three more wall mounted lanterns to be discovered, which were presumably part of the same works installation. They are all different though, with one being another SO Fifty, although its bracket has rusted off and is now hanging off the wall. There is also what I think may be a side entry AEI Amber. However the real rarity these days, is what I believe to be an Ediswan SSA/1. Compare with the image purloined from Mr Cornwell's pages. In addition to these, the imagery also shows some demolition which was getting under way at the time. You can just make out one of three top entry mercury / tungsten lanterns on wall brackets. I would suspect these may have now gone though. In view that you are obviously aware of the lanterns, I hope you will keep us informed on any plans for their future. The fact that demolition seems to be occurring further down the street, may indicate that further redevelopment plans could be in the pipeline. Here is an interesting lantern (or part of) which I am trying to identify. At first glance, it looks like one of the numerous GEC Z55xx series, however whilst there are similarities to be found on it, there are also a few inconsistencies which are making identification of this lantern more tricky, especially when compared to to the more usual suspects. Anyway, a general description of the lantern first. The canopy seems to have been cast out of Aluminium in the traditional manner. The stepped design along with the "GEC" motif is clearly apparent, although this looks to be an earlier version of "GEC" than the the font used on later versions - it is also slightly smaller in size. The lampholder assembly is simple in design, allowing vertical adjustment for focusing. It is secured in place using two small posts, screwed into the canopy. The original tropicalised felt gasket is still in situ, which is at variance for the rubber type usually employed on these types of lantern. The canopy interestingly does not have a die cast alloy bowl retaining ring fitted, although there is evidence one might have been part of the lantern originally. An integral "bracket" within the canopy casting which looks like it would have held the ring via a split pin. If there was a bowl ring fitted of the usual type, this then raises another unusual point in that there is no raised "nib" with which to engage the necessary toggle catch. Where such a nib would normally be found, the only thing evident is a what appears to be some form of fixed toggle. It looks like it is specially shaped to engage within a sprung steel tab on the ring itself. The canopy also has three screws mounted equidistant to each other. Each screw has a fibre washer, which suggests an enameled reflector plate would have been fitted at one time or other. Presumably, a glass refractor would have been attached to the reflector. A 4th screw complete with label is provided for the earth connection. This is certainly an unusual specimen, which is either an early version of something more common ie Small Oxford / Wembley, or something pretty unique.